Editor’s note: Leo Chen is a former product manager at Amazon and is currently the co-founder of Monogram, an iPad fashion discovery and shopping app funded by 500 Startups. You can find Leo on Twitter @leoalmighty; this article builds on one he previously wrote for us, here. Mark Suster’s post on why “media is racing to the middle” got me thinking about how fashion is moving in the same direction. To summarize Mark’s thesis: plummeting video productions costs and lower distribution barriers are allowing a new generation of content producers to compete against the big studios. The “race towards the middle (i.e. torso)” starts with YouTube leading the charge from the long-tail and big players like Hulu and Netflix investing in more niche content from the head end. In other words, there’s a huge opportunity for high quality content produced for large niche markets. Vertical retail – opening physical retail stores. Both of which are extremely high risk. If retail buyers don’t like your merchandise, you’re stuck with unsold inventory. If you opt to open your own store, the upfront capital investment is an insurmountable barrier for most. I believe we’re witnessing the beginning of a new class of brands/designers producing high quality apparel for niche audiences. At the head-end, e-tailers like Gilt are helping lesser known brands get exposure (albeit at heavily discounted prices). Traditional retailers like Nordstrom and Macy’s have been investing in niche in-house brands like Faconnable and Inc for years. At the tail-end, Etsy is a channel for aspiring designers to get distribution. Boutiques also dominate the long-tail and startups like Shoptiques are helping these boutiques expand online (pushing boutiques up the curve). 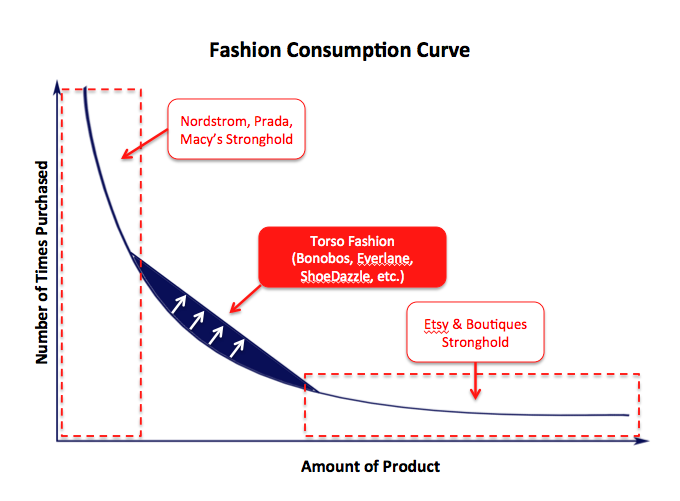 The hottest fashion segment today is vertical retailers targeting the center of the curve. Bonobos is a prime example of a vertical retail success story. They were able to establish themselves as a pure-play, web driven vertical retailer. Traditionally, web retailers had to carry other brands before moving into private labeled goods. Brands needed brick-n-mortar for distribution before setting up their own physical or web stores. Bonobos turned that on its head and built a web-only brand. Recently, sites like ShoeDazzle, Everlane, BeachMint and Indochino are taking a similar web-only approach. By foregoing the middlemen in the value chain and the costs of maintaining physical stores, these e-tailers are able to cut the waste in apparel distribution. As a result, consumers benefit from higher quality goods at lower prices. But for every Bonobos and ShoeDazzle, how many other great brands are out there struggling to rise above the noise? This current wave of vertical retailers share a common trait; they are tech savvy and understand how to leverage the internet and social media as a distribution channel. I believe there is a large, underserved community of aspiring designers that are largely clueless when it comes to building a web business or manufacturing apparel at scale. However, the real design talent likely lies within this underserved designer community. How disruptive is pure-play vertical retail? J.Crew was founded in 1983 as a catalog driven, vertically integrated retailer. It took J.Crew well over a decade and dozens of physical retail stores later to become a billion dollar business. This was before the age of Pinterest, Facebook and other social discovery channels. In comparison, Bonobos was founded in 2007 and after 5 years, their revenue numbers are in the $15-20M range from figures I’ve read; far from a billion dollar business and they’ve already begun carrying 3rd party brands. Don’t get me wrong, Bonobos is a great business but I see them more as a “content producer” rather than a disruptive platform like Hulu or Netflix. As discovery commerce improves and consumers broaden their tastes, I question whether pure-play vertical retailers will ever become billion dollar powerhouses. I consider myself to be fairly fashionable and have been loyal to a handful of brands. But over the past year, I’ve found my brand loyalty straying as sites like Gilt have exposed me to new brands I’m rather fond of. My monthly Bombfell subscription goes even further; putting pieces from up-and-coming designers I wouldn’t have heard of otherwise right in my hands. Pinterest’s 10 million monthly active users, most of which were amassed over the past 18 months, could potentially generate $45M/yr for Pinterest from affiliates alone. That’s already more than twice the revenue of Bonobos without the burden of carrying inventory. Sites like Joyus and Kaleidoscope found innovative ways to help consumers discover new brands and designers. Fab and Fancy are leveraging both professional and social curation with a drop-ship model. ModCloth and Karmaloop have been carving out their niche as e-tailers. I was speaking to a Zulily investor last week and learned that their business has been largely focused on exposing new brands rather than established ones (Zulily raked in $150M last year). As this trend continues, fragmentation will become increasingly overwhelming. Companies like Pinterest or Fancy have a platform mentality and it’s quite possible that one of these platforms could become the mesh that ties together all these e-tailers and become the ultimate discovery engine. Manufacturing. Unfortunately, the physical limitations of manufacturing and distributing apparel won’t go away like they did for books, music and video. Musicians and cinematographers can synthesize their creations with software and distribute it to millions. Fashion designers have far more hurdles to overcome to manufacture their designs at scale and distributing to millions of consumers. My father used to manufacture denim for ‘7 for All Mankind’ and ‘Forever 21’, it’s a painstaking process where fabric, buttons, labels and zippers have to be sourced from multiple vendors and manufacturing is often an iterative process to get the perfect wash and softness. This part of the value chain is often overlooked. Every fashion designer I’ve met had to learn about manufacturing from scratch and often traveled to Asia to source materials. More often, reputable manufacturers refuse to take low volume orders so up-and-coming designers often suffer with low quality manufacturers or settle for higher cost production in places like Hong Kong. I believe there’s a huge opportunity in helping designers group purchase materials and manufacturing capacity so designers can focus on what they do best, designing awesome clothes. In summary, it looks like the big money will still be in the platforms because they enable the democratization of commerce. Be it a discovery platform or one that helps new designers go to market more efficiently at lower costs. The web is empowering a new generation of fashion makers with lower manufacturing and distribution barriers while cutting out the fat in the value chain. I suspect we will see many more niche designers generating $1-10 million in annual revenues. For once, the little guys can have their products showcased side-by-side with the Pradas and Guccis of the world and quickly build multi-million dollar brands. It’s deflationary economics at its finest, and unlike technology, the new guys can offer equal quality merchandise as the incumbents from the get-go.